A number of authors have posted up on their personal blogs what appears to be a disturbing trend when it comes to one of the nation's largest booksellers: Borders Books & Music. It seems, that because of profitability, the Borders chain is cutting back on a number of SciFi titles that they used to carry, which has several authors up in arms, because if one of the biggest retailers doesn't stock their books, that represents a huge cut in their own profitability. I used to work at a Walden Books, which is owned by Borders, and I've noted a couple of problems with the chain that several of these authors highlight. I don't see this move as malicious intent on the part of the book chain - I see it more as misguided business models that are designed more towards profitability than towards promoting books and reading. Yes, this is a business - a very big one - but for all the need for Borders to make money, I've always seen a book store as a place where people can find something new, exciting, invigorating and fun, mainly through the joys of reading. This is far easier when it comes to a smaller, local bookstore, because they have the narrow shelves, creaky floors and obscure books, and generally, the knowledge and enthusiasm. As Frost points out, the book selling industry has never been a hugely successful one, but it's held up and kept moving by people who have a passion for books and reading. In my opinion, that's how it should be, and while this is largely unrealistic, it's still a nice thought to have. Several other authors have chimed in about this. Pat Cadigan slammed the company in her blog, Ceci N'est Pas Une Blog with this post. She notes that a lot of these stores tend to stock primarily movie edition scifi books - I, Robot and Minority Report as two examples, but not so much some of the lesser known, but equally just as good, authors. I think that she misses some of the bigger picture here when it comes to the business, but I do agree with several of the things that she says when it comes to losing our culture. While I don't think that we're losing culture (any sort of culture that involves buying or selling is generally pretty superficial anyway), it is drastically changing because of the internet. Some things that we hold dear, such as browsing a bookstore has been lost to clicking away on a computer screen, while the books that really sell are the rapidly written movie novelization for the genre movie of the month. Andrew Wheeler chimes in as well with a more balanced blog post here, and takes far more into consideration that bookstores are businesses, and that a lot of this is an effort to move over to online sales, in an effort to compete with the juggernaut Amazon.com. He also explains something about why the big chain stores are in business, and how that has changed some of the landscape, and how that seems to be coming back to bite authors and consumers at this stage. Larger chain stores, when introduced, were big, had a lot of stock and introduced discounts and a fairly consistent inventory to the equation, which some of the more independent bookstores didn't have. 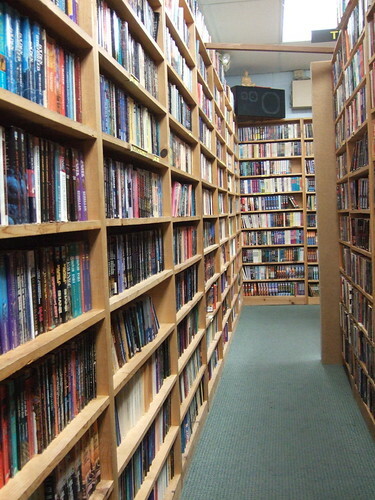 Here in Vermont, I can tell you that there are a number of smaller bookstores near my house - Bear Pond Books is great, but they have a very, very limited selection of Sci-Fi and fantasy books. Rivendell has a slightly better selection, while the Northfield Book Store also has a fairly limited selection. The Walden Books where I used to work up the hill has four or five times the selection of SciFi books, than all of those stores, and they can order just about anything on the market. Bookstores and culture is changing, mainly because of the internet. Major websites such as Amazon.com sell books very cheaply, offer a ton of options and are incredibly fast. Brick and mortar stores are struggling to keep up, and have had to really expand the selection of things that they sell, which is why you now see items such as candy, movies, cafes and discount cards. I'm not trying to defend Borders - I have several issues with some of the things that they do, but this is something that seems to be across the board when it comes to these big stores. The Borders rewards card is a particular problem - it was when I worked there and it still is. Employees are given a percentage goal for the number of purchases made with a card, and how many people are to sign up. The idea is customer loyalty - If a customer gets coupons from Borders or benefits because of these cards, they're going to shop there more. The problem that I've always seen is that the required percentages are insanely high, and it's very hard to obtain for a cashier, and I know several people who have resorted to scanning in blank cards just to try and keep up - at the cost of their jobs. Borders tends to be pretty draconian about their business policies, and one of the things that really took the rosy hopes that I had for working at a bookstore right away from me. I didn't like worrying about my sales figures more than telling a customer about a book that was really good - it became more of a how can I get this customer to buy more stuff? While again, this isn't a surprise or something unexpected when it comes with retail sales, it runs against everything that a bookstore should be. Bookstores have to remain in business, but the corporate structure really doesn't lend itself well in this case. The biggest problem when it comes to science fiction authors is that these cuts, at an attempt to become more profitable, are being hurt for the sheer superficial reason that they don't sell enough copies, and much more of the genre, as I've ranted before, is moving more towards media tie-ins rather than the purely original stuff. While this isn't bad, it is leaving the genre with more of an image that its just a pile of crappy novels based off of this movie or that video game. Across the board, media tie-ins aren't as good as regular fiction, in my point of view. There are exceptions here, and a couple authors who would disagree with me, but when it comes to the genre, I would much rather see original works, not based off of any franchise, get the shelf space, rather than a work that's largely a product (even though it might very well be a good product) advertising for something else, like a movie. This lessens the genre. This added step from Borders doesn't help things at all when it comes to authors who haven't gone and written for the media tie-in market, either because of personal choice or because they haven't been able to work their way in yet. 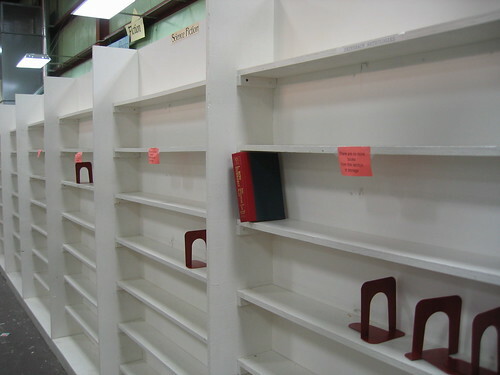 Increasingly, I'm finding it harder and harder to find what look like good reads on the bookshelves of stores, which is a real tragedy, because this is one way that the newer and upcoming authors can really break out and get an audience. I'm not advocating for a boycott of Borders, because that doesn't really help things - if nobody buys related genres from there, the sales go down and you've made the problem worse. Supporting your independent bookstore is generally the best thing to do, if there is still one around, but the main thing is to continue to follow authors and follow up on new ones, and order their books from somewhere, even if it requires jumping through several hoops. Because in the end, you want to read the book, and the effort to get it should make it all the more worthwhile. Edit: Wednesday: Neil Gaiman has chimed into the argument from his blog here.